Another day, another murder. That’s the life of a homicide cop, even in the near future time period Lieutenant Eve Dallas inhabits. The date may be sometime in the 2060’s, but New York is still New York and crime still runs rampant through the streets. This particular day’s death appears to be a mugging gone wrong but appearances can be deceiving (and in a murder investigation, they usually are). This victim was a nice woman, a wife and mother with a loving family and no apparent enemies. A mugging seems so much more likely than a professional hit, but evidence doesn’t lie. Maybe it was the dead woman’s work as an accountant that got her in someone’s bad books. To find out, Eve will have to dive into her billionaire husband’s world of high finance to see if she can come up with answers. Fortunately the mighty Roarke is willing to volunteer his services to help his wife’s investigation, especially once the killer starts to take an unhealthy interest in Eve. A story built around accounting misconduct could have easily been a yawner, but Robb wisely keeps Eve (and the reader) focused on the people more than the crime. The plot unfolds in Robb’s usual fast-paced, hard-edged, somewhat profane style (f-bombs and more are sprinkled throughout the story). Popular series characters all get their due, including Eve’s sassy sidekick Peabody, the Roarkes’ snarky butler Summerset, and the one person who can strike terror into tough-as-nails Eve’s heart: Trina the makeup artist. As readers familiar with this series know, if these books were movies they would definitely be rated R. We’re left in no doubt whatsoever that Eve and her impossibly alluring husband Roarke enjoy married life to its fullest. Given that they are married it’s nice to know their relationship is so strong, but personally, I could do with rather less detail about their passionate encounters. 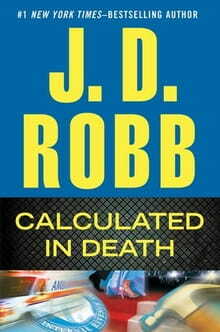 The last J. D. Robb title I read (Delusion in Death) dealt with a nasty series of terrorist attacks that turned rooms full of innocent people into homicidal maniacs, so this time it was an absolute pleasure to follow Eve on a normal murder investigation. Readers who are new to this series should expect to periodically find themselves lost as characters blithely refer to previous cases (and a movie made about one of them—see Celebrity in Death) with no explanation for newcomers. It’s not that germane to the plot, but given that the movie’s premiere takes up so much space in the book a little more background would have been nice. Since the “in Death” series is set in the future, new readers should also take note that in Eve’s day society has fallen even farther down the moral spiral we see on today’s news. All manner of sins—and a general vague contempt for spiritual matters—are the norm. Eve thinks about God only long enough to wonder how “they, it, he, she, whatever” keeps track of the world’s many departed souls, but her musing is more about heavenly bookkeeping procedures than any kind of spiritual quest. This is pretty much par for the course for a mainstream mystery, but may offend some readers. In the final tally, those who enjoy the exploits of Eve and company will likely find Calculated in Death an acceptable, though not outstanding, installment in this long-running series.